Belated post from last weekend, which was a foodie weekend. Partially by design, and partially by needing to use some Groupons before they expired. One of them was for Golden Steer Steakhouse, reportedly one of the best steakhouses in the country according to some awards. It was established in 1958 and is in a unique location, the northernmost end of the Strip on Sahara. It is another one of those restaurants in an unassuming location on Sahara between Las Vegas Blvd and I-15. The exterior is off-putting, but the interior has that old time feel of the original Las Vegas. I ate at the bar because I was by myself, didn’t want to take up space, and wanted to watch the football games on. 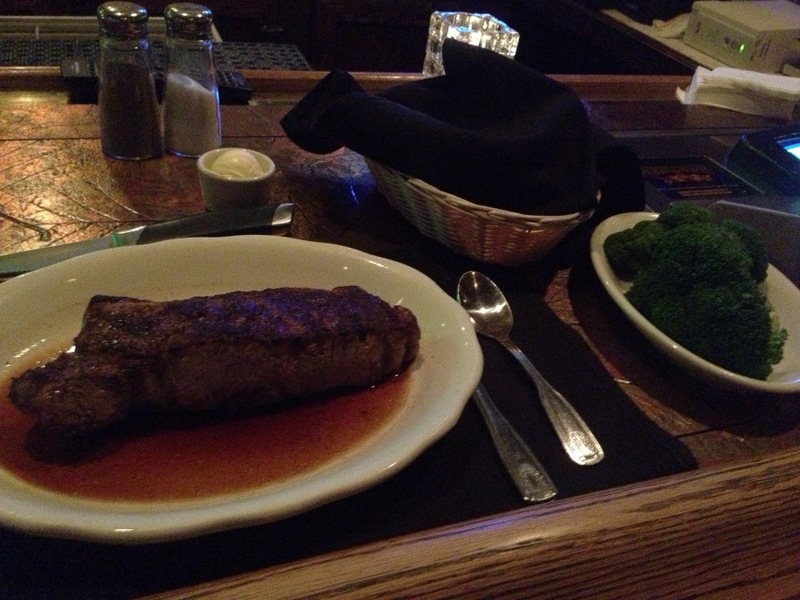 I got the NY Strip with a side of broccoli. Sadly, the best thing about this meal was the bread. I ordered the steak medium rare and got very rare. And as far as the broccoli went, they literally took two full stalks and blanched them and put them on a plate. I know sides aren’t the focus of a steakhouse, but for $9 bucks, I’d expect more. Overall ended up $10 bucks over my $50 Groupon. Might be the least satisfactory Groupon I’ve ever used. Rating- 3/5 Environment is good. Food was lacking and very pricey. Maybe you’d have a different experience though. Price range – Expensive. Probably wouldn’t have gone without a Groupon. Recommendation – I’d give it a pass. Though going into a place like that with a Groupon might have been a lost cause from the get go. That’s a shame. I went there years back and I recall the food being pretty darn good. What i remember most about the place was the red velvet wallpaper and the feeling that at any minute some mob boss was going to come walking through the back door. I’ve been meaning to take a return trip, but I think I’ll go ahead and hold off. That feel is still there! And who knows, maybe the food was a fluke for me? Or maybe I’m just really picky about my steaks.